Enjoying every mile of a whole marathon, from the first step to mile 26, sounds like an impossible hope. But that’s genuinely how I felt during Loch Ness Marathon this weekend. 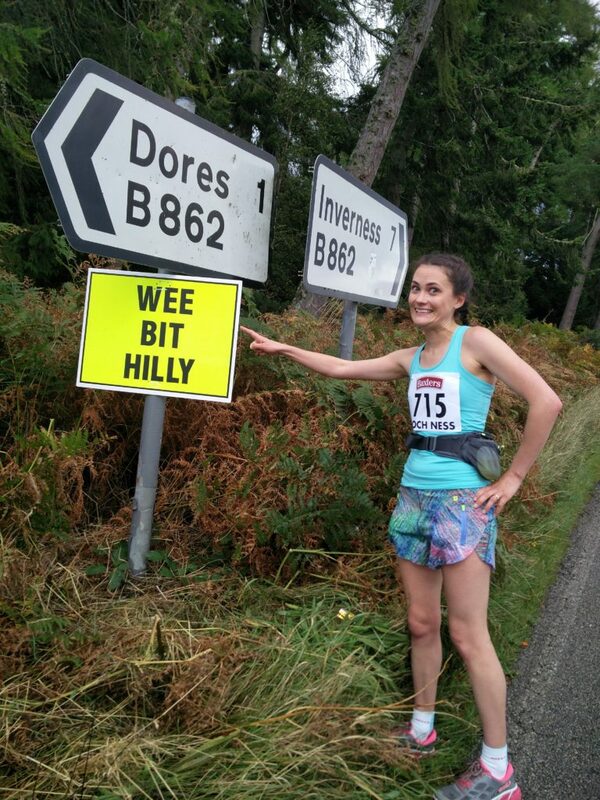 The entire thing was a joy, and I was so thrilled run beside my mum over the gorgeous Highland route. Everything in the run up to the race fell suspiciously well. Trains timed perfectly, a lovely stop off in Edinburgh on the way up, and almost all kit remembered. One thing had been forgotten – mum’s running gloves – but she was handed a pair in a prize draw at the pasta party the afternoon before the race. It felt like a pat on the head from the universe – but I wondered if we were using all of our luck up too early. I had approached the race itself with some trepidation. Despite my best intentions, my longest training run had been just 18 miles, so I was worried about how I’d cope after that point. 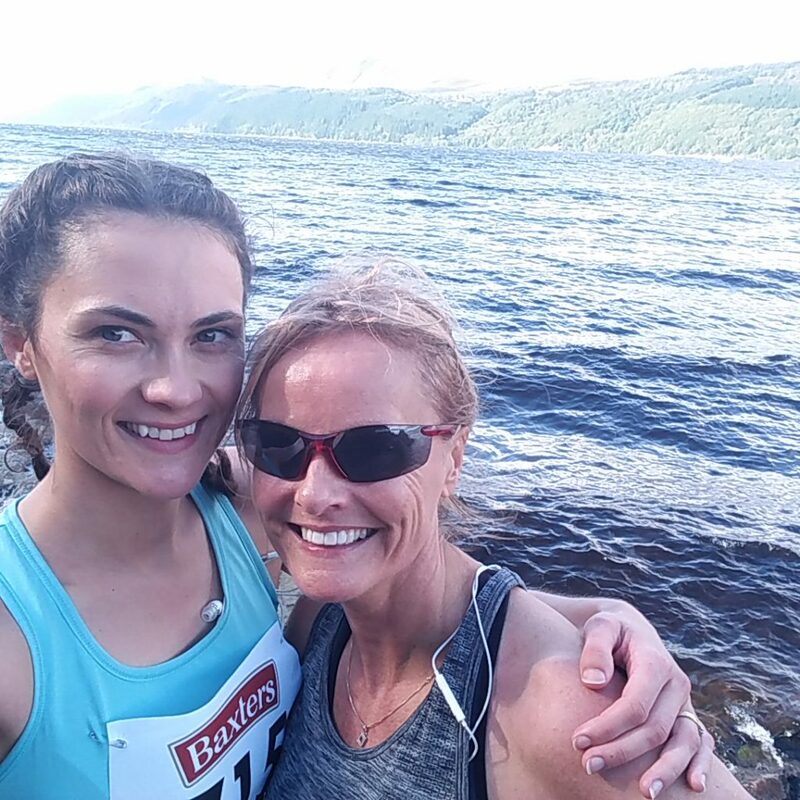 I have a bit of a history of being overwhelmed when the going gets tough – see, my recent Edinburgh Half Marathon panic attack, and my Yorkshire Marathon massive roadside strop for particular examples… Mum is much more steadfast than I am, while I am sometimes unpredictable, even to myself. It’s really impossible to imagine, from the comfort of your sofa, how you’ll feel towards the end of a hard race. In truth, I was far less afraid of Nessie than I was of potential monsters within myself. 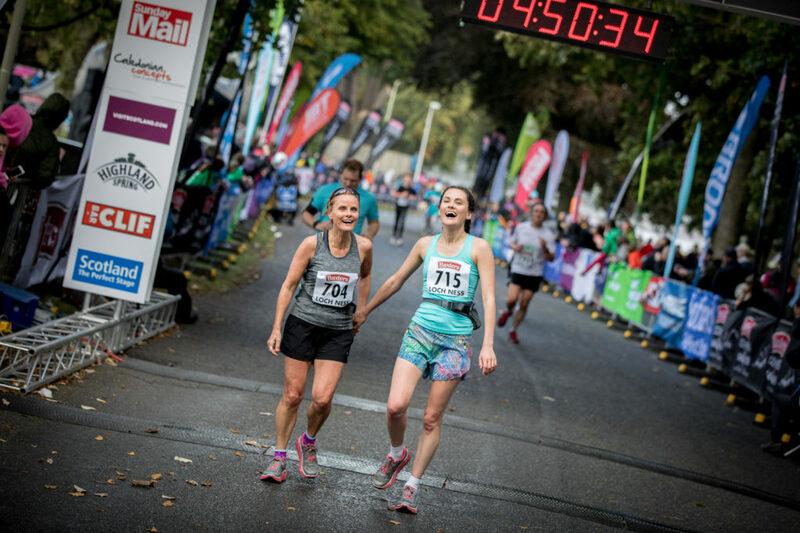 We knew that we weren’t going to be setting any PB’s this time around – the course is renowned for being hilly, and this was mum’s first marathon back after her debilitating sciatica last year. This meant that we could take the pressure off ourselves and enjoy the experience, and I think this made all the difference in the end. To doubly make sure we didn’t add any stress on, we – brace yourselves – didn’t even wear our GPS watches for the race. As we waited nervously at the start line, a rainbow appeared and it was announced over the tannoy that twenty pensioners from Tokyo were taking part in the race, inspirational members of the ‘Full Hyaku 100 Marathon Club’. My two favourite groups of people in the world are the elderly and Japanese people. More good omens. As we crossed the start line, the music of pipers played over the purple heather and I felt my skin prickle with anticipation. I started to feel that everything was, in fact, going to be alright in the end. 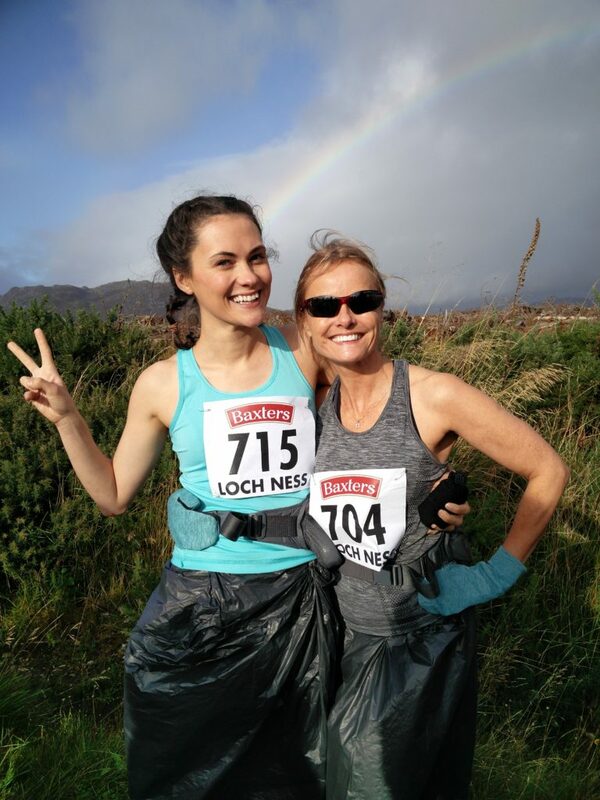 The first few miles of the race are all downhill, running through the countryside toward The Loch, and without our watches on, each mile marker came as a terrific surprise. “Mile 4, already?” and surprisingly, this feeling continued throughout the race. Rather than keeping an eye watching the little increments of each mile and its pace go by on my watch, mile markers were a joyous surprise each time they popped up in their fluorescent glory. Despite the name, you don’t actually see Loch Ness until you’re several miles into the race, and it’s astonishing when it finally appears. As the route is one straight line, you then keep the Loch to your left for almost the rest of the race, almost forgetting the sheer breathtaking beauty of it by the time you’ve been beside it for two hours. We were incredibly lucky, and there was a slight wind at our back, until the last few miles when it picked up and we had a pretty strong wind at our back. The good luck continued! We had been given the advice before the race to take the time to appreciate the scenery, and were glad of it – we tried to remind ourselves throughout to take a look around. Confirming that we were in the race for a great time, not a good time, we found time for scenery selfies and loo stops. While nobody loves talking to each other more than me and my mum, 26 miles can get a bit much even for us. Given that the route was closed-roads and there weren’t too many runners, we decided to take a couple of podcast breaks, during which we ran together in companionable silence, both listening to the same podcast (Kermode and Mayo’s Film Review) in our headphones. This made a huge difference to my perception of the race – as it was broken up into 5 totally manageable chunks – The Exciting Beginning Bit, podcast break, The Middle Bit, podcast break, ‘Only a Parkrun to Go’. As the race progressed, I felt calmer – the beast I had feared from myself never appeared. Perhaps because of the beauty and location, the other runners were a lot friendlier than in city marathons we’ve done before. We exchanged high-fives with father and daughter running together as we criss-crossed at water stations and along the route, and had a great time chattering away to everyone during the ‘wee hill’ at mile 18. In matching bright pink vests, the Japanese contingent offered great smiles and thumbs up throughout the race in response to my rubbish holiday Japanese attempts to cheer them on. At about mile 23, I pointed out to Mum that all the spectators cheering us on were stunningly gorgeous, and she pointed right back to me that I was completely off my head on endorphins. Runner’s high is definitely real, and it just kept getting stronger. From mile 25, I had to work hard not to burst into jagged tears of joy. When we crossed the finish line to receive our (absolutely incredible) goody bag, it all broke loose. I burst into hot, grateful tears. I was so thankful to have this experience with my mum, who couldn’t even have walked across the street this time last year. Thankful for our health, and for the lovely strangers we ran with, and the beautiful land we live in. Thankful that I didn’t throw a tantrum by the side of the road. The icing on the cake? We crossed the line in the brilliant chip time of 4.44.44 – we couldn’t have PLANNED that better if we’d tried, or actually worn our watches. What scenic marathon should we do next? Amazing! 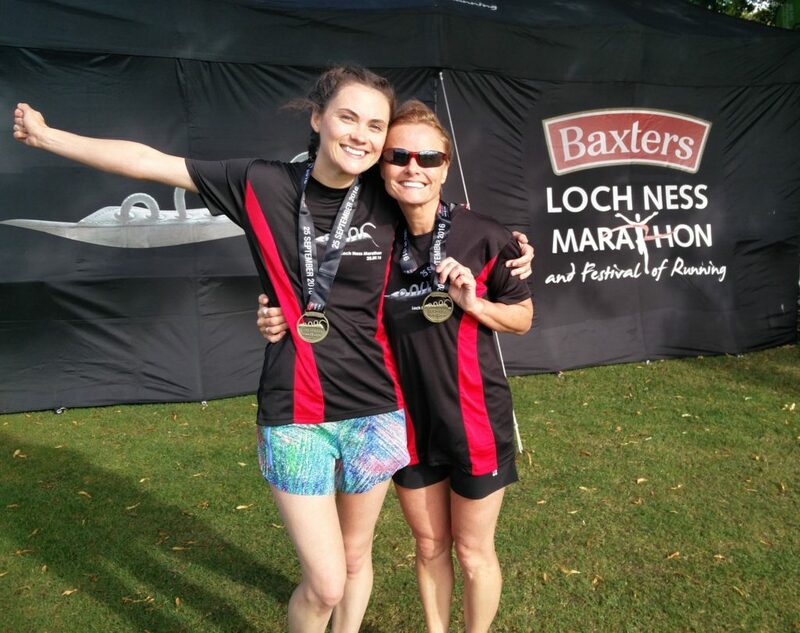 This race is definitely in my to do list – so glad you both enjoyed it as much as you did! I ran the Disney Half marathon this weekend without my watch, and loved it. No continuous checking of distance or pace and the pressure was off, allowing me to really just enjoy running. I still did a decent time so I’m thinking this might be the way forward….! Yay for naked racing! I’d love to do a Disney race sometime, too. Have been scanning internet for review of Stirling and Richmond marathon to decide which to do next (just completed Stirling, also great interesting course), I think your review has swung it for Stirling! Thanks ps. not sure I can get away from the watch just yet….. I mean Loch Ness & Richmond..